Klayman: President Trump! Pull Barr's Nomination Now! 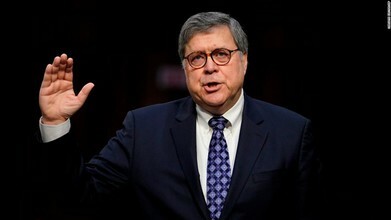 (CNN) — Attorney General nominee Bill Barr reaffirmed Tuesday that, if confirmed, he would allow special counsel Robert Mueller to finish the Russia investigation, but Barr's testimony surrounding a prior eyebrow-raising claim that more should be done to investigate the Clinton Foundation, and his related correspondence with a reporter on that issue, has caught the attention of his critics and raises fresh questions on how he'd handle the issue if confirmed. Barr was interviewed by The New York Times in the fall of 2017 about the pressure President Donald Trump continued to mount on the Justice Department to investigate his political foes. The Times' Peter Baker reported at the time that some conservatives had latched onto a theory that a Russian energy nuclear agency donated to the Clinton Foundation in order to later secure Hillary Clinton's approval of its purchase of a uranium mining company when she was secretary of state -- otherwise referred to as "the Uranium One scandal" by some in conservative media.